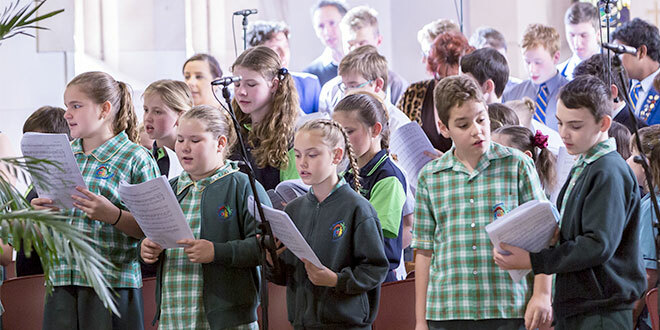 One voice: Catholic schools from around Brisbane archdiocese combine in one choir for a Mass in St Stephen’s Cathedral last Sunday at the start of 2017 Catholic Education Week. BRISBANE Catholic schools launched a week-long celebration of their distinctive Catholic ethos in an official ceremony at St Stephen’s Cathedral last Sunday. Hundreds of students from 40 schools packed out the cathedral on July 23 to kick off the annual Queensland Catholic Education Week celebrations from July 23 to 29 with a Mass where Archbishop Mark Coleridge presided. The Mass was celebrated ahead of the official CEW launch in Cairns on July 26. More than 300 Catholic schools across Queensland will take part in the week-long celebrations marking the state’s achievements in Catholic education. Brisbane Catholic Education executive director Pam Betts said the sight of hundreds of students in the cathedral highlighted week’s theme, Sharing the Journey. “The Catholic Education Week Mass is one of the rare times when students from schools all across the archdiocese can come together to focus on what makes our schools so distinctive – their Catholic ethos,” Ms Betts said. Traditionally Catholic schools across the state dedicate time during Catholic Education Week to showcase the unique opportunities students receive at Catholic schools. “Catholic Education Week is an opportunity for students and staff to reflect on our broader mission and remember that we are sharing the journey not just with those in our own school, but with all those who learn and work in Catholic schools across Queensland,” Ms Betts said. The official opening in Cairns at St Andrew’s College will be the first time the state-wide celebration of Catholic education launches outside of Brisbane. Queensland Catholic Education Commission executive director Dr Lee-Ann Perry said the Catholic ethos was evident in schools from the Torres Strait in the north, to Currumbin in the south and out west to Mount Isa and Quilpie. “This year our theme for Catholic Education Week is Sharing the Journey and we want communities right across the state to share in the experiences of their local Catholic schools,” Dr Perry said. The launch was live-streamed from 10.30am on the Catholic Education, Diocese of Cairns website at www.cns.catholic.edu.au/CEW-launch.